The Centre for Alternative Technology maps a completely renewable future Largest survey of global energy scenarios shows 100% renewables can deliver 100% of the time! In the largest survey yet of the rapidly rising delivery potential from renewable energy, a new report from the Centre for Alternative Technology (CAT) shows that clean energy could now meet all our electricity needs, at all times of the day, all year round. 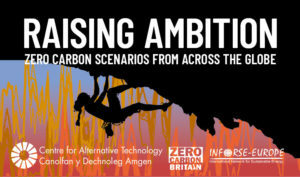 The report – Raising Ambition: Zero Carbon Scenarios from Across the Globe – draws on scenarios designed to meet the climate targets of the Paris Climate Agreement, developed at the global, regional, national and sub-national scales. Over 130 scenarios were assessed and mapped – the largest number yet in any comparable exercise, including 18 in-depth case studies. They draw on cutting-edge modelling work for net zero, deep decarbonisation, and up to 100% renewable energies. The geographical range is the broadest yet too, covering from Tanzania to Los Angeles, and South Asia to the Baltic. 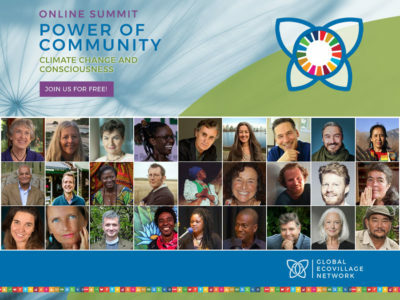 “The Global Ecovillage Network supports communities around the world to explore new ways of delivering their needs. To assist this process, we have produced the largest survey yet of scenarios for switching to climate friendly energy, to help cross-fertilise ideas on a range of different scales”. says Paul Allen, Zero Carbon project coordinator at CAT. Since a previous assessment in 2015, the number of scenarios has grown by 30% and their scope has spread to include more majority world countries. These include raised ambitions for decarbonising electricity supplies up to 100% and doing so between 2030 and 2050. Raising Ambition finds that to take the Paris climate targets seriously, all countries must be supported to prepare 2020-2050 focused full net-zero scenarios which work across disciplines; linking energy, transport, buildings, diets, land-use and sustainable, natural carbon sinks. This will ensure each country’s development pathway and industrial strategy aligns with the mitigating actions required, creates trusted investment frameworks and helps develop social licence. Paul joined the Centre for Alternative Technology in 1988, developing a wide range of renewable energy systems including solar medical systems for use overseas. Paul has lead the ground-breaking Zero Carbon Britain research for 10 years; liaising directly with Government, business, public sector and the arts.